AfD top candidate Alice Weidel, center, gets flowers during the election party of the nationalist 'Alternative for Germany', AfD, in Berlin, Germany, Sept. 24, 2017. In the photograph, the distraught blonde-haired woman is surrounded by lascivious Middle Eastern-looking men. The caption refers to “New Year’s Eve,” a reference to the mass sexual assaults reported mainly in Cologne on December 31, 2015, involving men of Arab or North African appearance. Posted on social media sites earlier this month, the photograph included the symbol of the far-right populist party, Alternative for Germany, which on Sunday eclipsed Angela Merkel’s re-election as German chancellor by winning nearly 100 seats in the Bundestag, becoming Germany’s third largest parliamentary party. 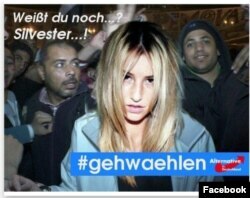 Falsified photograph posted on social media sites showing a blonde-haired woman surrounded by Middle Eastern-looking men used to agitate grassroots followers of far-right populist party Alternative for Germany. The photograph — it has emerged — was a falsification: the woman pictured was a British glamor model, her image lifted from a glossy magazine, and the men, Egyptians protesting in Cairo in 2011. In the three-month election campaign that ended Sunday mainstream politicians, some from minority backgrounds, lamented the rabble-rousing tactics of the AfD and its grassroots agitators and fellow-travelers and their menacing social media propaganda playing on fears of Islam and Muslim criminality and on foreigners in general. Winning seats in the Bundestag marks a startling new phase in the party’s progress from the fringe of German politics to closer to the center of power in Berlin. For far-right counterparts elsewhere in Europe the AfD’s electoral breakthrough serves as a consolation prize for election setbacks this year of like-minded populists elsewhere — Marine Le Pen in France and Geert Wilders in the Netherlands. 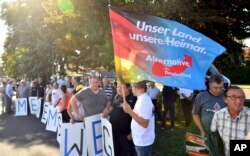 FILE - Supporters of the Alternative for Germany party hold signs reading "Merkel must go" and a flag reading "Our country, our homeland," as they protest during a campaign event of German Chancellor Angela Merkel in Bitterfeld, eastern Germany, Aug. 29, 2017. For mainstream German politicians, and Germany minorities, the rise of the AfD, which has called for the sealing of borders and a slimmed down appeals process for asylum-seekers making deportations easier, is a door opening on a German past they thought long buried. “This is the most aggressive election campaign that Germany has seen since 1945,” lamented Senegal-born Karamba Diaby, who was first elected to the Bundestag in 2013 to become the country’s first black African lawmaker. Last month, he filed a legal complaint against members of the openly neo-Nazi National Democratic Party, whose supporters have been backing the AfD, for calling him an “ape” on a Facebook page. For Diaby and other lawmakers from Germany’s major parties, the arrival of the AfD raises perplexing questions about how they should treat the first open nationalists to sit in the German legislature since the 1933 razing of the Reichstag by Adolf Hitler. But treating AfD lawmakers any differently from other elected representatives could play into the hands of the far-right populists, allowing them to portray themselves as political victims and to claim that a political oligarchy is intent on ignoring the 12.6 percent of the population that voted for them. Commentator Kay-Alexander Scholz argues that ostracizing the AfD in parliament would likely backfire. He maintains all the established parties “should be asking themselves what they did wrong over the last several years to set the stage” for the AfD. Merkel went out of her way on Sunday night following the election results to reach out to AfD voters - especially those who defected from her Christian Democrats. “We want to win back AfD voters by solving problems, by taking account of their concerns and fears,” she said. 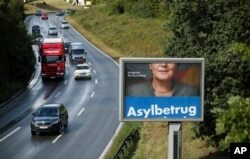 FILE - A revolving election campaign poster of Germany's anti-immigration party, Alternative fuer Deutschland, AfD, reads "Asylum fraud" as Angela Merkel, German chancellor and leader of the Christian Democratic Union party, CDU, appears partially obscured on a billboard in Duesseldorf, Germany, Sept. 14, 2017. One of her advisers, Michael Fuchs, told VOA that “it isn't good enough just to view the party as Nazi.” He argued that “some members are just conservatives” and he held out the prospect that under the pressure of day-to-day legislative work the AfD could split between its more moderate wing and the radicals. Chancellor Angela Merkel’s decision to admit more than a million refugees, breathed new life into the party, which lurched rightwards. Since 2015 the party has secured seats in all but three of Germany’s 16 regional parliaments. The party appears in no mood to shift its confrontational tactics, a rejection of Germany’s post-war collaborative political ethos. Gauland signaled that in his post-poll comments to cheering supporters in Berlin: “We will change this country. We will chase them down, Angela Merkel and whoever else, and we will take our country back,” he said.